Calling all Peace Region filmmakers and anyone else who’d like to register a team for an adrenaline-filled weekend of filmmaking in the Peace Region! 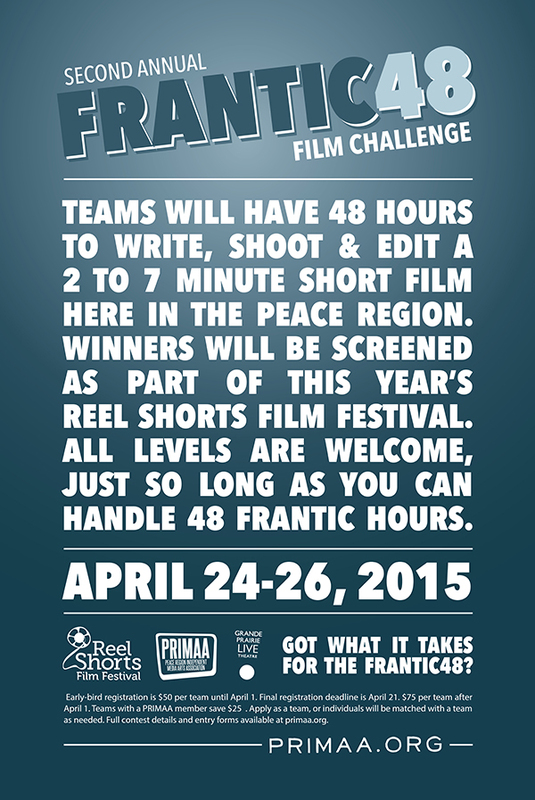 PRIMAA and the fest have joined forces to put on the second annual Frantic48, a 48-hour film challenge the weekend of April 24-26, 2015 (early bird registration deadline April 1; final registration deadline 6:00 pm, Tues, April 21st). A selection of completed films (as many as possible) will screen during the fest on Fri, May 8 and a juried award for Best Film will be presented as well as an Audience Choice Award. The Frantic48 is the wild creation of Monty Simo, PRIMAA’s President of the Board. Rules and regulations can be found here and FAQs can be found here. If you think the Frantic 48 sounds fun (in a crazy sort of way) and you’d love to participate but don’t have enough willingly insomniac friends to put together your own team, email Monty at littlenotepads@yahoo.ca and he’ll do his best to find a team for you to join. And remember, you don’t have to be in Grande Prairie to participate, or even live in the Peace Region – only the 48 hours of the Frantic 48 has to be spent in the Peace Region as you make a short film of 2-7 minutes using an assigned prop and line of dialogue (the same for all teams) and an assigned genre (unique to each team). Good luck!